Modern-day elephants are members of the same family as the mammoths - that is the family of giants which are quite simply the largest living land mammals on earth ! For decades we thought that were are only two species of elephant that of Africa, and of Asia. However, scientific progress has allowed us to distinguish two subspecies in Africa which have been named «the savanna elephant » (Loxodonta africana africana) and the forest elephant (Loxodonta africana cyclotis) and if one adds Asian elephants (Elephas Maximus) there are in fact 3 species of elephant and not 2 ! How can we distinguish them ? One can easily differentiate between African and Asian elephants since the Africans are larger and heavier. More specifically, they average 1 metre higher at the withers and weigh 1 to 2 tonnes more. The larger of the two also has larger ears. Let's take note that that while both male and female African elephants have tusks and a flat skull, it is only the male Asian elephant that have them and the skull of this species has two bumps. Another visible difference is that at the end of their trunk, the African elephant has two prehensile fingers whereas the Asian elephant has only one. Last trick to differentiate the two their backs. The Asian elephant has a rounded back whereas the African elephant has a hollowed-out, sloped back. And the trunk what a tool ! In addition to their imposing size, one will of course always notice the trunk of an elephant which is a very special multi-functional tool. And a heavy duty tool at that - weighing on average over 100 kilos. Interestingly, elephants use their trunks to pump water, which they then will pour into their mouth, water grass and leaves indeed, an extra « arm » with which he or she can pick up just about any object. 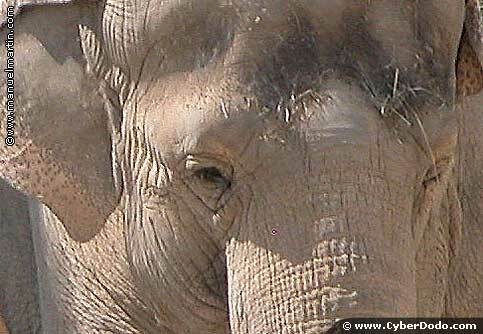 The trunk is formed by an elongated upper lip and the nose. Tusks - an opportunity and a curse. Tusks are actually teeth of the upper jaw which never stop growing, and which as said, are both objects of defense, and also tools. The elephants use them to dig the ground in search of the vegetables of which they are so fond, and also to rip the bark off trees. While the size of a male elephant's tusks is a very important trump card to conquer females, it is also a source of great inconvenience, attracting other creatures considerably more dangerous hunters ! Indeed, elephants' magnificent pieces of ivory are responsible for the terrible massacre that this species has long suffered and continues to suffer. Where do the elephants live ? Being vegetarians, they need to consume large quantities of food (around 200 kilos) and water over 100 litres) each day such that they are constantly on the move. They spend the greater part of each day on the hunt for food . Depending on the species, they live on the savanna or in forests, but either way, they are never far from water given their great need to regularly hydrate their skin. Can they move quickly ? While they tend to move about at a calm pace, they are also capable of running at speeds of over 20 km/h which is quite impressive given an animal this heavy. Their weight, however, does not allow the elephant to jump, which is an exceptional fact in the animal world. How do they live ? Do you remember the file on the bees ? While quite a different genus, elephants are also social animals that live in groups (herds) that can be characterised as matriarchs that is, groups under the authority of a female. These herds of a dozen or so members comprise females, calves and young males. At about twelve years of age, males will leave the herd to live alone. Elephants have a life expectancy comparable to humans. How do they reproduce ? An unborn calf will remain from one and a half to up to 2 years in the belly of his mother (making this the longest gestation period of any land mammal). Once born, a calf will have no guarantee of being able to grow up, given that he or she will encounter a number of predators that will try to lure him away from the adults that protect him. Fortunately, though, thanks to the herd's careful attention (particularly that of the mother who will feed him or her from 3 to 5 years) - the majority of calves do reach adulthood. How can we protect them ? In addition to hunting for the ivory of elephant tusks which has threatened elephants for decades (an ivory trade ban came into effect in 1989) and which continues as illegal poaching in certain regions, there is another major threat. 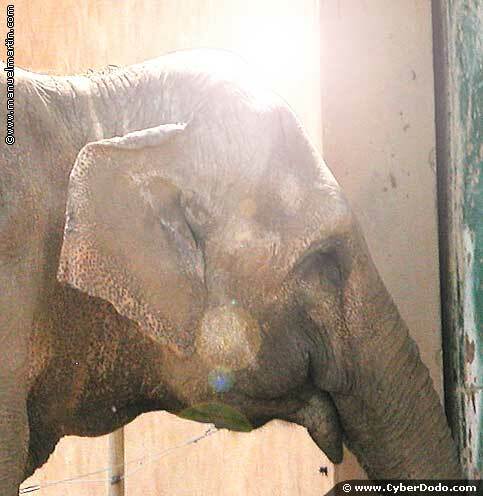 Elephants, just like so many other animals, suffer the disappearance of their natural habitats. As a measure of the extent of this phenomenon, take note that scientists estimate the global elephant population to have been reduced to one tenth of its original size in just one century. The protection of elephants therefore encompasses both the protection of their habitat as well as the fight against illegal poaching. These super-powerful giants are very intelligent yet incapable of defending themselves against their main enemy humans !